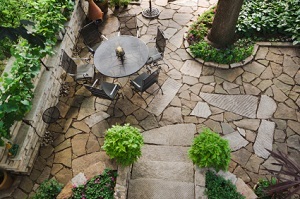 Backyard patios create a beautiful space to relax or entertain friends and family. If you're looking to create the backyard of your dreams, hardscapes are one of the best options available. Hardscapes are stone structures that provide long term additions to outdoor spaces, giving you the option of creating a custom space that suits your needs. At New Age Contractors, we provide complete hardscaping design and installation services. Our experts will work with you to develop the right features for your home, giving you a finished product that looks great and you can enjoy for years to come. If you're interested in adding a hardscape feature to your yard, give us a call at 1-844-676-4349 or click below to get started. We offer free estimates in Summerville, Charleston, Mount Pleasant and throughout the surrounding areas. Outdoor kitchens: An outdoor kitchen is a unique feature that's perfect for having friends and family over. These kitchens can come complete with all types of appliances and seating, making it the ideal outdoor hosting space. If you're looking for a hardscape that makes an impression and gives you the function you need from your yard, New Age Contractors is here to help. We will help you create the perfect design for your home and give you a finished product that fits all your needs. Call us today to get a free estimate on fire pits, patios, and all other types of hardscaping features. We offer all our masonry services in Summerville, Charleston, Mount Pleasant, Ladson, Goose Creek, Beaufort, Johns Island, North Charleston, Hanahan, Moncks Corner and throughout the nearby areas.